Sources: Sources for data in tables: Equity Market and Fixed Income returns are from JP Morgan as of 03/22/19. 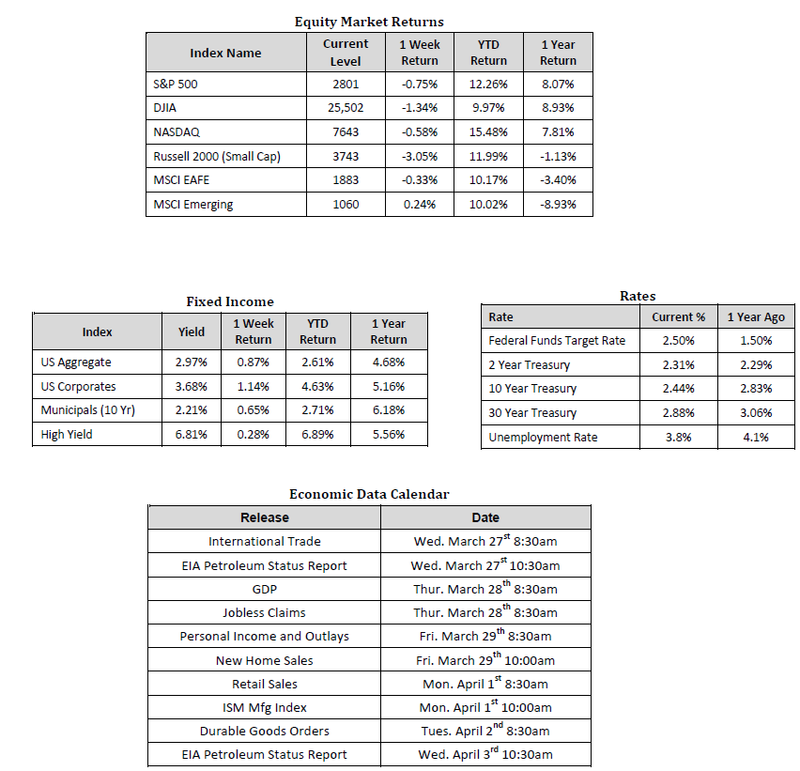 Rates and Economic Calendar Data from Bloomberg as of 03/25/19. International developed markets measured by the MSCI EAFE Index, emerging markets measured by the MSCI EM Index. Sector performance is measured using GICS methodology. Global equities finished in the red after a very choppy week of trading. In the U.S., the Dow Jones Industrial Average, S&P 500 Index, and the NASDAQ Composite declined 1.34%, 0.75%, and 0.58% respectively. The S&P 500 Index settled at a level of 2,801 to finish the week. Overseas, developed markets mirrored their U.S. counterparts falling 0.33% and the apparent lone bright spot was emerging markets which advanced 0.24%. In fixed income, they 10-year U.S. Treasury yields continued their downward descent finishing the week at 2.44%. We had a little bit of everything influencing capital markets last week. Let’s start in the U.S. with the Federal Reserve’s decision to keep the federal funds target rate unchanged in a range of 2.25%-2.50%. The decision was unanimous and highly expected given the Fed’s increasingly “dovish” stance. The Fed has repeatedly signaled more patience regarding their monetary policy approach over the past six months. Moreover, they outlined plans for gradual balance sheet reduction. As we have mentioned in the past, the Fed has multiple tools available to them to achieve their goals and buying and selling assets is one of them. As it stands, the plan is to slow the pace of balance sheet reductions starting in May and conclude the reduction by the end of September. It is projected that there will be no rates hikes in 2019 (we would also contend that there will likely be no rate hikes in 2020 either) and it’s worth noting that the expectations of the neutral rate has come down considerably in the later stages of the current expansion period. In the past, particularly in 2019, markets have rallied with the expectations of continued relatively low interest rates. However, there was more to consider last week that weighed heavily on investor sentiment. Trade issues reemerged as we received reports that another meeting between the U.S. and Chine could be delayed until June. President Trump also stated tariffs on Chinese goods could remain in place for a substantial period of time. In addition to trade talks, global growth remains a concern as both the manufacturing and services sectors in the U.S. increased at a slower than anticipated rate and European factory output declined in March. Despite a rally on Thursday led by Technology stocks, markets gyrated downward as the Treasury yield curve between the 10-year yield and the 3-month yield inverted for the first time since 2007. Yield curve inversion has long been considered as a recessionary signal so the inversion spooked many investors. However, we do not believe this is a near-term signal that investors should be overly concerned about at this point in time as, on average, recessions historically have not begun until 20 months after the onset of an inverted yield curve. With a flurry of company specific, economic, and geopolitical news coming out daily, we can’t stress enough the importance of working with an experienced financial professional to help manage portfolios through various market and economic cycles within an appropriately diversified framework that is consistent with investor’s objectives, time-frame, and tolerance for risk.